The conspiracy of Japanese wiring and electronics suppliers to put the screws to Toyota and other customers has now led to the largest antitrust action in history. What we know appears stupendous in scope. To date 20 suppliers have paid fines totaling $1.6 billion in the US (an additional $347 million in fines in Europe and Japan brings the total to $1.95 billion). Some 21 executives have pleaded guilty to felony antitrust charges including jail time and financial penalties. Wired participants, secret locations, coded communication and an expanding list of auto parts and firms, spanning 10 or more years and at least 4 continents. Wild! Then there's what we don't know. To date all of those charged have pleaded guilty. As a result, the Department of Justice (and their counterparts in Japan, the EU, Canada, Mexico, Korea and Australia) have not had to enter detailed charges into the public record. With no trial, no evidence need be made public – and even though every corporate law firm in Detroit is racking up billable hours beyond their wildest imagination, those involved have done a truly impressive job of keeping their mouths shut. And with cause: private lawsuits in the US can seek treble damages, and at least 45 such have been filed (and for now consolidated in the District Court in Detroit). The fines that firms have willingly paid suggest those fines are well below the maximum – though back of the envelope calculations suggests DOJ used a rule of thumb of 8% of revenue for the early wire harness settlements. These and other firms may however have benefitted from the antitrust Amnesty Plus program, which provides for low or even no fines for those who 'fess up' early and help the prosecution. So the amounts could easily hit $5 billion. However, without evidence, such suits will go nowhere, and Federal courts have put a stay on those suits while criminal investigations are ongoing. Attorney General Holder has indicated that the Department of Justice is far from concluding their work; for their part, the Europeans raided six companies this month. But then there are those wiretaps of phones and tapes of meetings: it appears that the DOJ is limiting itself to central players, and going at them with such ironclad cases that they can avoid wasting resources on the morass of a jury trial. In some ways, the industry invites conspiracy. The design and engineering process for a new vehicle involves so many components that doing a full start-from-scratch purchase for each part in a vehicle is administratively infeasible; purchasing departments just aren't large enough. So when a Toyota comes out with the next generation Camry or a Ford the next F-150, they will naturally lean towards the incumbent supplier – they know the engineers, they will have the manufacturing capacity. With suppliers involved in the actual design process, they have to be selected before specifications are firm. Yes, the car companies pursue outside bids to try to keep the process honest, and when there is an entirely new component it's a fully competitive bid. Likewise firms with new technology can get their foot in the door – and those are exactly the firms I see as a judge of the Automotive News PACE award competition. With so many vehicles under development – in the US alone carmakers will launch 365 new vehicles between now and 2015 – it's clear that purchasing departments have fallen down on the job of tracking costs. But these are not the highly engineered items where at present one or two firms control the technology, such as turbos or common rail diesel systems. When I look at a list of the components named in the guilty pleas, they are for the most part not items where new technology is changing the game: starter motors, alternators, seat belts, wire harnesses. While new materials are coming, in the case of harnesses leading to thinner gauges and now even lighter-weight and cost aluminum wires, these products are mature. But this is necessary: you can't readily fix prices when a good isn't a commodity. When you know your and your competitors costs are similar, then you can agree on what the price could be and the level at which your conspiracy can fix it. Part of the reason is again administrative: car companies with few exceptions have no internal manufacturing capability for the items they procure. They thus rely upon comparisons with past prices, adjusted for changes in the price of materials and known or anticipated productivity improvements. Therein lies the opportunity for a cartel: once suppliers have started screwing their customers, the car companies can come to believe that it's normal. Bids look sensible given past prices. Since harnesses with their miles of wire and hundreds of connectors are one of the most expensive component purchases a car company makes, companies always seek outside bids – but thanks to the conspiracy either find few firms express interest, or come in with ridiculous prices. [For an example see "Ford Alleges…" Automotive News, Aug 5, 2013] This should raise suspicions, but apparently did not set off alarms. While Toyota was firm mentioned in initial guilty pleas, the list of victims now includes most of the industry's major firms. Toyota's purchasing department may have been overwhelmed in its go-go years of the noughts (ending with the early retirement of the firm's top 4 executives), purchasing departments throughout the industry clearly were not up to the task of sniffing out carefully coordinated price fixing. With wire harnesses, 4 suppliers dominate the Asian market, with Delphi Packard (yes, the name I use is anachronistic) a strong contender elsewhere (and as the one major player not named in this segment, finding that it's suddenly gaining market share in Nagoya). So how did the conspiracy arise? In Japan (as elsewhere) suppliers share panels in engineering conferences and industry associations; ironically, as I found in my own PhD research in the mid-1980s, they may even play golf together at events hosted by their customers. Put them together in the ex-pat supplier community in the US and informal interactions become more likely. Or at least that's my supposition of how things got started, and why it remained undetected in some cases for a full decade. With stays on the private lawsuits, with uncontested guilty pleas in all the criminal cases, and with those involved so far keeping their lips sealed, few details have come out on the US end. It may be that journalists in Japan can find out more – what goes into the public record may be different, Japan's Freedom of Information Act is stronger than that in the US, and when plied with drinks officials and mid-level auto industry managers may be more willing to speak less-or-more off the record. Journalists and stock analysts should also be asking Toyota about their purchasing operation, about how they could be bamboozled out of so much money and how they're working to fix that. Finally, all should be lauding the Japanese Fair Trade Commission, which in its pursuit of this case is showing that it is more capable than in the past – handling the domestic side of a multinational price-fixing conspiracy – and is willing and able to act in the interest of consumers. However, this is less economically meaningful than at first glance. 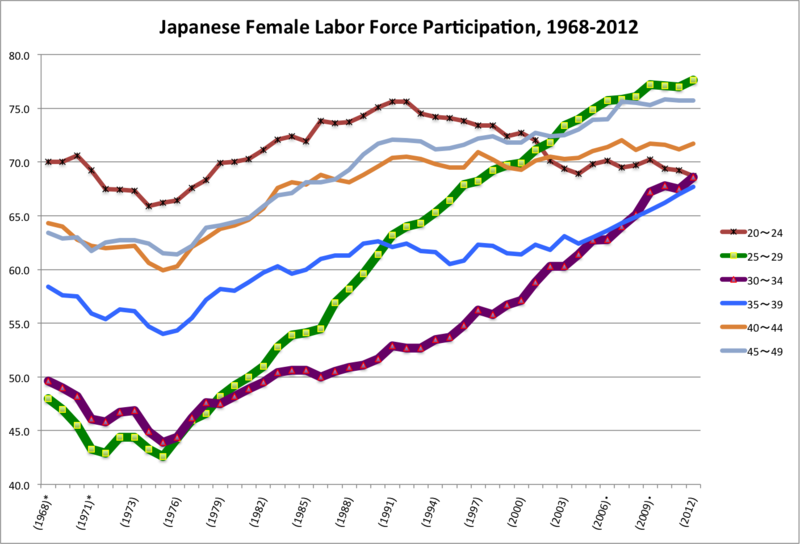 Women are not going to be able to save Japan from its demographic challenges. Of course it is these very same women who are not having lots of children. But more to the point, these young women are now the only daughters of an already smaller generation of women. Policy changes could smooth things, and from a microeconomic perspective (and a lifestyle perspective) could bring many benefits, particularly to women. [For an amusing portrayal of the challenge of a stay-at-home father, albeit in a US context, see Kim Stanley Robinson's Forty Signs of Rain. But from a macroeconomic perspective it's too late for less male-centered policies around the workplace and the home to make a difference. 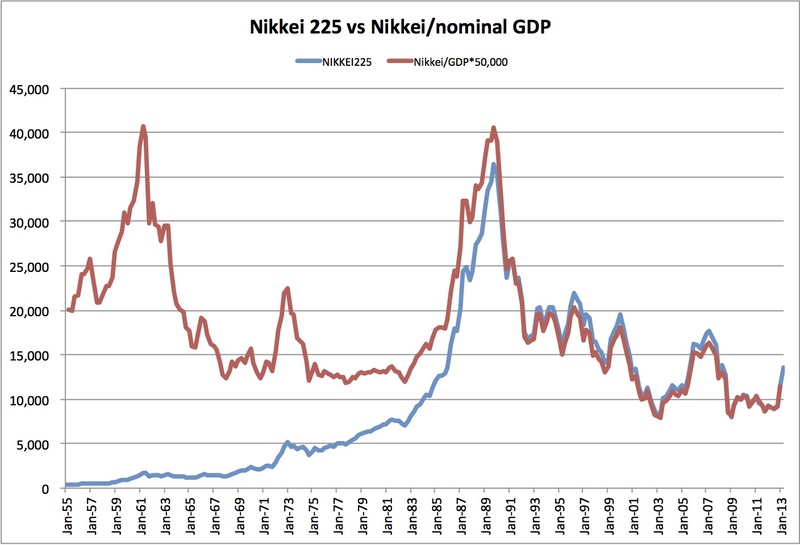 Matt Yglesias has a Slate post on the 1987-91 Nikkei bubble. His core graph, drawn from the St. Louis FRED database, is on the left; I've shorted the time period to go from 1965 through 2001 to match the SNA1968 nominal GDP time series. 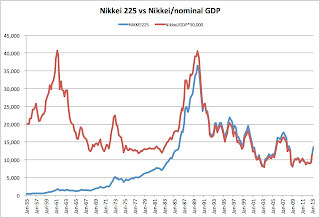 The same series, divided by nominal GDP, is below. The same series, divided by nominal GDP, is below. There’s still quite a bubble, but relative to GDP stock prices had been even higher in the early 1960s — and except around the time of the oil crisis tracked nominal GDP from 1967 until 1985. 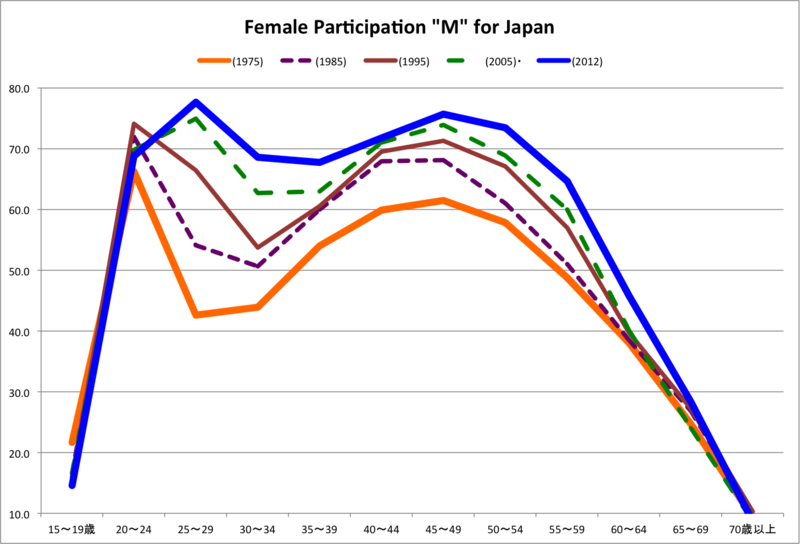 Participation is higher across the board, though the "M" for women persists. 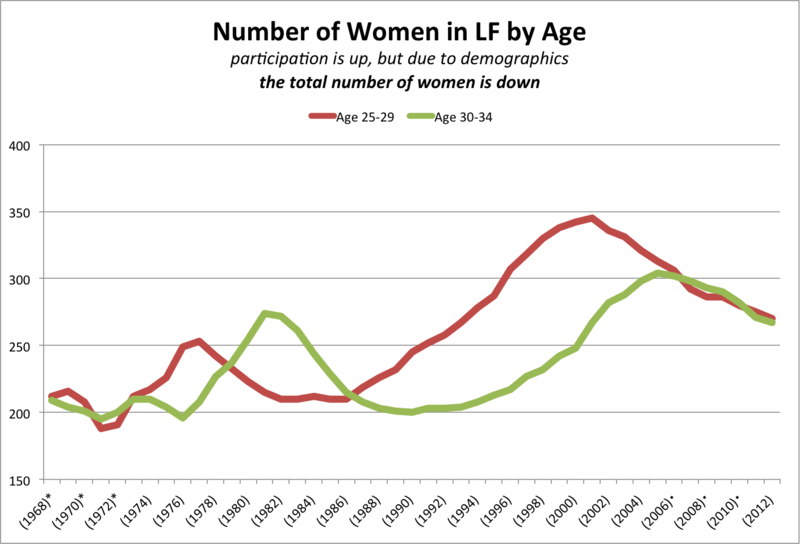 The exception is the 20-24 age bracket, where lower participation reflects women attending 4-year colleges (75% of young women attend some sort of post-high-school education, including junior colleges and technical schools). The data show the rise of post-secondary schooling for men, but also a drop in participation of 25-29 year olds since the banking crisis, by 2+ percentage points. Older brackets dropped about 1.5 pct pts. 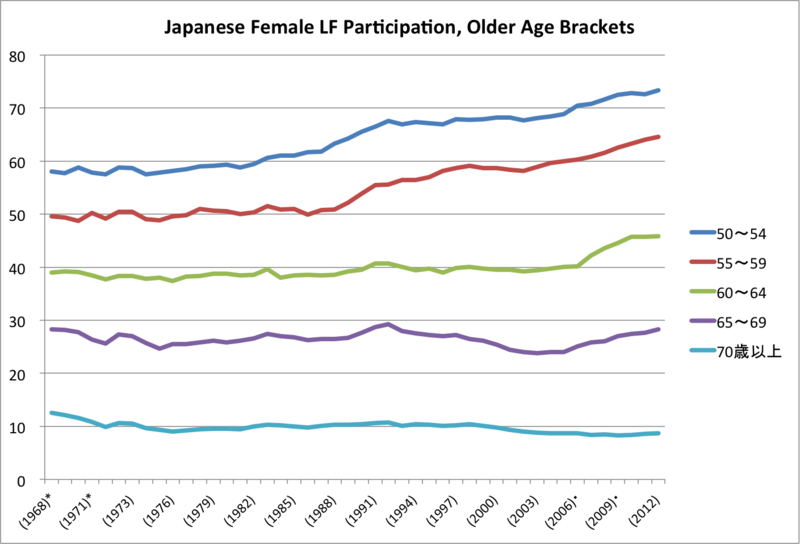 Data for women in older age brackets. 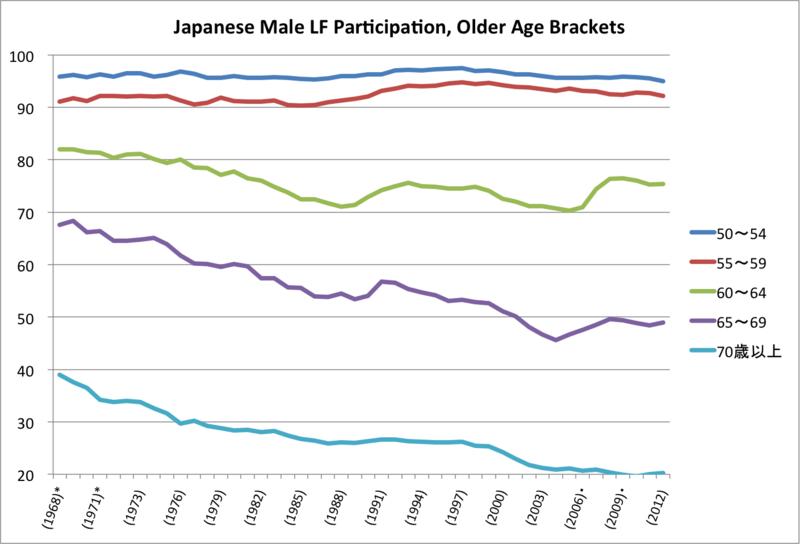 Except for the age 70+ bracket, all have risen, but only over the last 6-7 years for women around retirement age. Over the last 50 years we see the advent of retirement as the norm for men age 65-69, but with some reversal the last 6-7 years, similar to the shift in participation by older women. 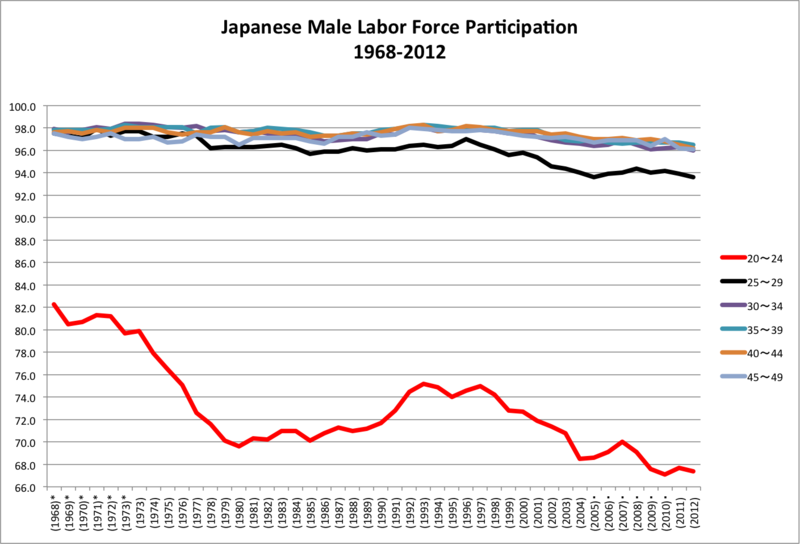 As I grew up as an economist, I heard from one and all that Japan was special. First, despite its small size, it was going to take over the global economy; as the 19th century had been Pax Brittanica [though with precious little peace], the 21st would be Pax Japonica, to be accomplished without colonies but with other large, developed economies as competitors. Underlying this success, and its clout in export markets, was a set of management practices that rendered its firms superior: governance by insiders who looked to the long and not the short run produced wonders; the MBA-finance skill set contributed almost nothing to this success, so mayhap the lack of such individuals in senior management was salutary. Japanese consumers were odd, too, they didn't buy cars, they shopped at mom-and-pop stores, and they insisted on eating expensive domestic rice. 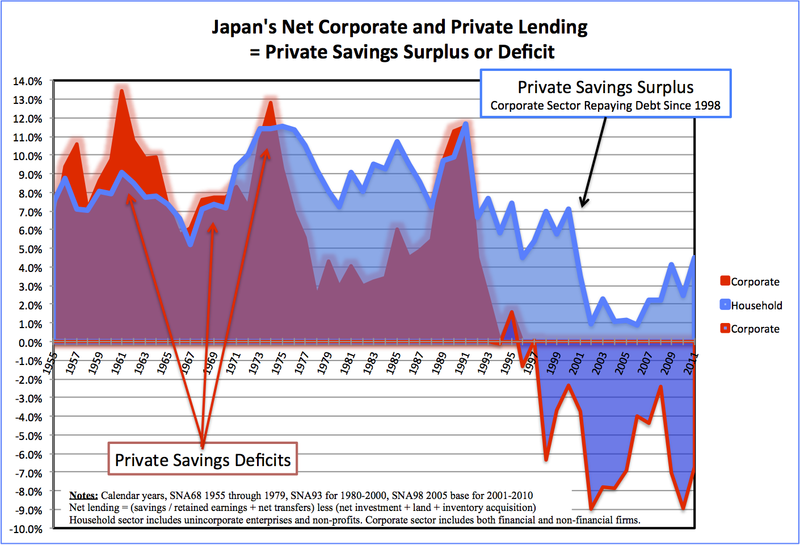 Then there was the bubble, peculiarly Japanese, and the lack of rapid recovery, due to the incompetence of the BOJ and the peculiarities of its Cabinet system that gave the bureaucracy undue power and resulted in on-again, off-again fiscal policy that produced deficits but not growth. All of these positions held a grain of truth, but now look silly – an overreaction, but making that case is not my purpose today. So how about Japan government debt? – the media and even not-so-conservative politicians in the US and Europe are fixated on reducing deficits in the face of excessive governmental debt. They are reading Greece as a general case. Yet it is a small country whose debt is not denominated in its own currency, and most of that debt is held abroad. It has also been running trade deficits, has an inflated public sector and social security system and on and on. No one has to hold Greece's debt, almost no one held enough that they couldn't dump it. And dump it they have. If Greece is in fact exemplary then Japan should be in worse shape. 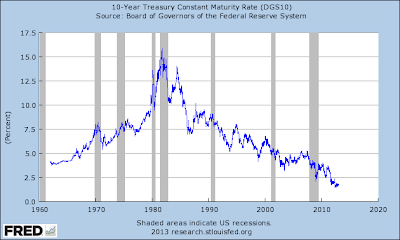 It has run large deficits for two decades, without a crisis as an excuse. While the previous government passed a tax increase, the first stage of which will take effect in April 2014, it's not clear the current government won't invoke an "economic conditions" escape clause. It's population is aging, indeed already aged. And however bad Greece might look – debt of 112% of GDP in 2007 – Japan's gross debt is worse, at 214% of GDP in 2012 (OECD estimate) versus 181% for Greece. Yet carrying this logic to the Japanese government bond (JGB) market has been a disaster. Someday someone will get rich shorting JGBs, but to date that strategy has instead proved a "widow maker". [Google the term and you'll find lots of hits, going back years. Two examples are from Reuters and BusinessInsider]. But is Japan special on this front? Not if we look at the US. We have somewhat lower levels of debt, somewhat smaller structural deficits, but they are difference in degree and not in kind. 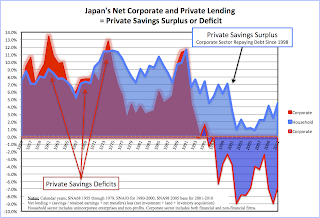 (For Japan, the normal figures lump in local government debt as well as the debt held by the Bank of Japan and other semi-governmental entities.) Sure, we have Republicans and Democrats unable to pass little things such as a Federal budget … the Japanese have had the DPJ, and – lucky them? – now have the LDP-Komeito coalition back in power. 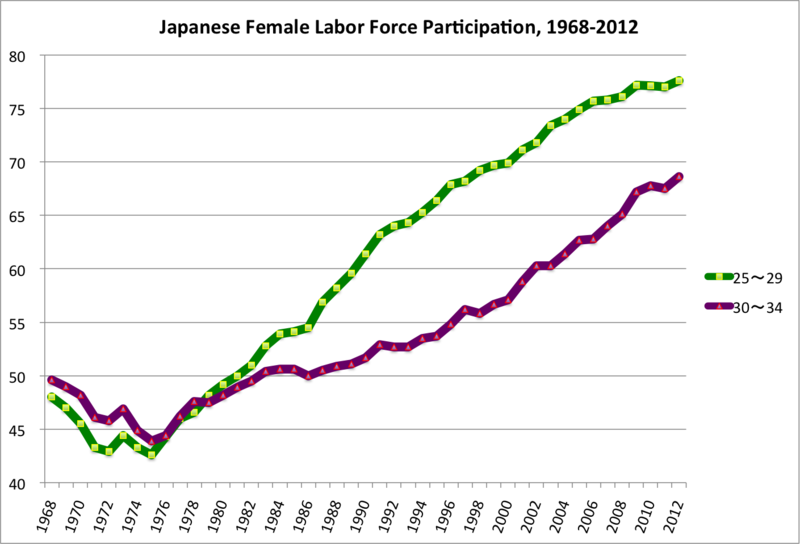 Meanwhile, Japan has escaped from its bubble, and the US economy is growing. 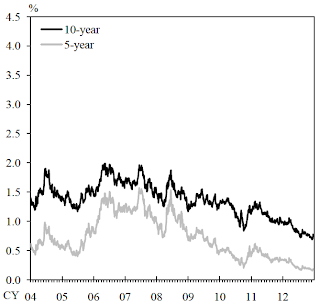 Despite all the hype about the US debt-deficit pairing, bond prices can do nothing but rise. For those looking at Chinese real estate, or anything in Europe, both countries continue to look like safe havens, or (for both economies do have problems) at least havens. Here, too, Japan looks ordinary. The Cassandras making this case in Japan and in the US may not be believed. But both look rather ordinary, and those among the Cassandras in the market are quite happy to keep taking the bond vigilantes' money.